As you probably know, this year, Japan will have a new emperor. The current one – the Heisei Emperor – will retire on April 30th, and his son will ascend to the throne on May 1st. There are many preparations for this event, some things are known already, and others have yet to be decided. It is known that the retired emperor will receive the title Jōkō, which means “retired emperor” and he is the first to hold this title in almost 180 years. It is not known if he will stay in Tokyo or not, although Kyoto people do (more or less secretly) hope that he might come to live in the palace here. It is known that on April 30, the Heisei Period will officially end, but it is not known which name the new era, starting on May 1, will have. This will be announced on April 1st, and for practical reasons, it is unlikely that the new era name will start with a T, S, or an H.
It is also already known that, on occasion of the enthronement of the new Emperor, there will be 8 national holidays in a row, from April 29 – May 6. That’s because the change will take place during Golden Week, where there are already several holidays to begin with. April 30 is a “Sandwich National Holiday” because, according to Japanese law, all work days falling between two national holidays are automatically national holidays as well. May 2 is a “Sandwich National Holiday” like April 30. May 6 is a “Happy Monday Holiday” because, according to Japanese Law, all National Holidays falling on a Sunday will be celebrated as a day off on the following Monday. Add to this the weekend before, and (most of) the Japanese are looking at 10 days off in a row. The ceremonies are not over at this point, the real enthronement will take place only on October 22nd and will probably involve a very private and secret ceremony at Ise Shrine, the highest ranking shrine in Japan. Already now, ceremonies are being held since this year is the 30th anniversary of the current emperor’s enthronement after the death of his father in 1989. There is a large exhibition organised by the Imperial Household Agency that shows photos of many of the Heisei Emperor’s visits to Japanese and foreign cities, as well as gifts received at those occasions. Also on display are the traditional clothing worn by the current emperor and empress at their enthronement ceremony 30 years ago. 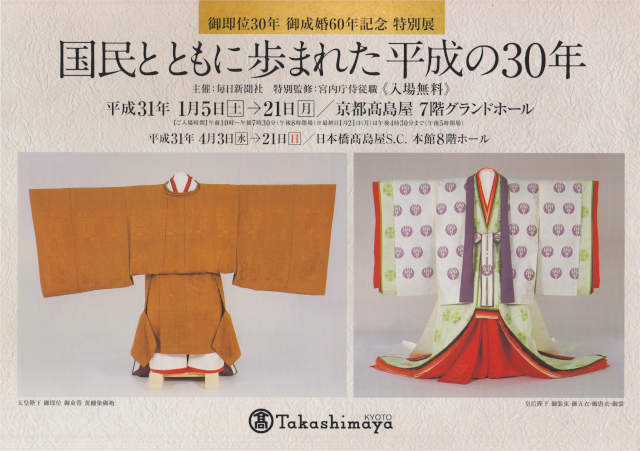 If you are in Kyoto, this very popular exhibition is taking place at the Takashimaya right now, and definitely worth a visit. This entry was posted in All Things Japanese by Iris. Bookmark the permalink.